How To Find Balance Between Work and Personal Life? Creating balance between work and personal life can be difficult for those who are accustomed to devoting the majority of their time to their employer.People who are self employed will likely struggle even more with establishing this balance, since they are responsible for company and have more invested in it's success. When you conjure up images of being a success at work, what do you picture in your mind’s eye? If you imagined long hours at the workplace late into evening, slaving over tasks that can’t possibly wait until tomorrow, you may have bought into the idea that success at work demands your marriage to it. You may even feel guilty about the idea of a vacation, or taking the weekend off (without checking voicemails and email messages). In our progressive culture, we have started to see more of a trend toward self-care. Part of self care is looking at what we need to stay physically and emotionally healthy, and most of the time this entails a healthy balance between work and the rest of your life. There may be a silent eye-roll or a chuckle here for many; ‘that’s for other people, I can handle it,’ you might think. 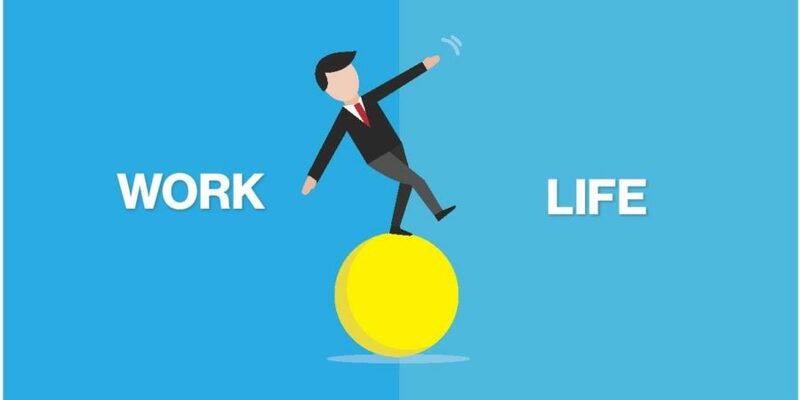 Work/life balance is not only good for you, it is ultimately good for your long-term success in business and with interpersonal relationships. And you may feel like you’re handling it, but in reality, you may be slowly toasting your way to burn-out. The stressed brain releases a hormone called Cortisol, which is an automatic response that is part of our nervous system to signal danger. Over prolonged periods of stress, Cortisol continues to be released and this has detrimental effects on the physiology of the brain, as well as causing a plethora of bodily symptoms and emotional regulation challenges. Sometimes we become so skilled at adaptation, we fail to recognize when we are highly stressed, particularly if it has built gradually over several weeks or months. Our natural tendency is often to “push through,” but ignoring our stress for too long can have detrimental effects that can sneak in when we least realize it, making us vulnerable to conditions such as depression, heart disease and sleep issues. These issues, while being independently unpleasant all on their own, will surely impact your ability to take care of things at work and at home, creating a double-whammy effect. Are You Addicted To Over-Working? Some struggle with finding balance between work and life due to an obsessive quality about working that could be driven by a number of factors. We’ve all heard the term “work-a-holic” to describe people who spend in inordinate amount of time at their jobs. While a healthy work-ethic is a terrific character trait, work-o-holics often over work themselves to meet a need in their personal life or to fill a void. Take this quiz to find out if you may be a work-addict. Creating balance between work and personal life can be difficult for those who are accustomed to devoting the majority of their time to their employer. People who are self employed will likely struggle even more with establishing this balance, since they are responsible for company and have more invested in it’s success. A healthy work/life balance requires some good limit setting. Restructuring your schedule to reflect a reasonable work day is part of this adjustment. Establish a start and stop time for each day and try to stick with it so that you are getting a better balance between your time work and your personal time. If you have a difficult time leaving at the time you had set up, try planning something directly after work to ensure that you leave when you are supposed to; perhaps dinner with a friend or a workout session. It may also help to create some personal goals for yourself that reflect your other interests in life. Have you always wanted to take a pottery class? Do you want to plant a garden? What are some interests outside of work that you can develop plans around that will ensure you leaving the workplace at a reasonable time? Another thing to consider is how you view yourself. Many of us come from a background that honors and respects hard work and it becomes part of an honor code and source of value and identity to work “too hard”, even at the expense of one’s health. If this sounds familiar to you, it may be helpful to explore your other values to help move you toward a more balanced lifestyle. Ask yourself the following questions: 1.) What else do I value about myself, other than my work ethic? 2.) What else is important to me in life and how can I pay some of my attention and energy toward those parts of life to express my value and appreciation? Part of a healthy work/life balance is honoring the parts of yourself that need attention. When you think about balance for your mind, body and spirit, what sorts of images come to mind? How are you taking care of your mind? Are you learning and exploring new ideas? How about your body? Do you exercise and feed yourself healthy foods to nurture your wellness? Do you rest and attend to your medical needs? Does your spirit feel cared for? Do you spend time in nature, see friends, attend to your connections with others and/or with your higher power? When we get pulled too far into work mode, we tend to become too immersed in one frame of mind. In order for balance to be restored, we need to honor the other aspects of ourselves and find ways to provide them care. Sometimes, work/life balance can start with a simple question: what do I need? The tempting answer may be “I need to get my work done.” But other parts of you are calling out answers that need equal attention. Maybe you need a break from work. Maybe you need a long walk, a good laugh or a delicious meal. Self care and work/life balance need to become a priority in order for your greater self to emerge. Do you want better work/life balance? Discovering the diversity of human existence can be the catalyst you need to begin transforming your life. Many of us have found mental and emotional wellness through self-awareness and unconditional self-love. However, self-discovery can be a challenging process. This is especially true among individuals who feel pressured to conform to perceived expectations regarding job performance, cultural background, or gender identity.Even the highest functioning people can struggle to maintain the self-care necessary for overall well being. How Can We Strike the Right Balance to Beat Our Addiction to Work?